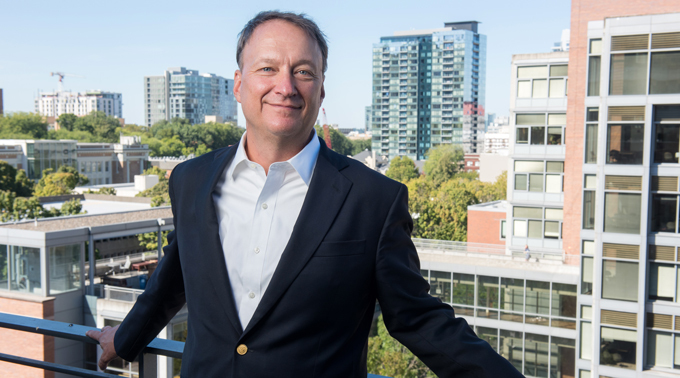 AS A TEENAGER growing up in Portland, David Bangsberg M.D., M.P.H., used to study in the libraries at Portland State University and Oregon Health & Science University. “My first college lecture was at PSU, and my first research job was at OHSU,” he says. Bangsberg’s career has taken him to Boston, New York, Baltimore and San Francisco and abroad to England and Uganda. He was most recently director of Global Health at Massachusetts General Hospital, the largest teaching hospital affiliated with Harvard Medical School, where he was a professor. But in September, he returned to his hometown to become the founding dean of the new OHSU-PSU School of Public Health. The school is a partnership between the two universities. “Each institution lists it as one of their schools,” says Sona Andrews, provost and vice president for academic affairs at PSU. “The students will get a degree from both institutions.” The arrangement is unusual—this will be the only joint school of public health in the country in which two institutions are equal partners, says Andrews. THE TWO universities committed to the creation of the OHSU-PSU School of Public Health in 2010. Elena Andresen became the interim dean in 2014, overseeing the school’s process of accreditation, which is expected to be completed in early spring 2017. There are currently 1,443 students at the school; 1,233 are undergraduates, and about 210 are graduates. Bachelor’s through doctoral degrees are offered in such areas as health studies, biostatistics and epidemiology. A dual Doctor of Medicine and Master of Public Health degree is also offered. But at the time, HIV was raging through East Baltimore. Marginalized populations, including gay men and injection drug users, were particularly devastated. He left the Ph.D. program, giving up the scholarship that went with it, so that he could start addressing HIV in gay men and injection drug users at a free clinic in Baltimore. After Johns Hopkins, Bangsberg moved to New York City (“the only place where you could find more HIV and structural violence than East Baltimore”) and then to San Francisco (“because that was the Mecca to study HIV”). He went on to work on some of the same issues in rural Africa while a professor at Harvard and director of Global Health at Massachusetts General. Stephanie Argy is a graduate assistant in the Office of University Communications. What’s in a Zip Code?